...From two separate singing canaries that the legendary Castillo del Lago high in the Hollywood Hills is soon to be listed with an electrifying asking price between fifteen and eighteen million clams. 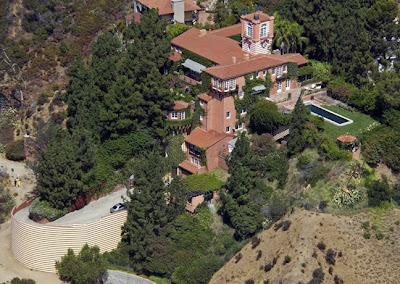 The 9-story fortress-like mansion on Mulholland Highway, was designed and built by John DeLario in 1926 and sits in the shadow of the Hollywood sign overlooking the higgledy-piggledy shores of Lake Hollywood. Originally built for oil explorer Patrick Longdon (some resources say his name was Patrick Logan), the house was once home to notorious gangster Bugsy Siegel who allegedly used it as a speakeasy and gambling parlor. In the 1950s, the house fell into a sad state of disrepair, was vandalized and, at one point, caught fire. The property eventually came under ownership by some guy with the rather impressive name of Baron Patrick de Selys-Longchamps who, according a knowledgeable source we chit-chatted with, lived on the property for a few years in un-restored condition. The Baron sold to a couple named Willfong who did over and did up the house and, we're told, had it published in Architectural Digest. Records show that in 1990, the Willfongs sold to Richard Grossman and Lisa Lyons who happen to be the folks currently selling the old Cecil B. deMille estate in Laughlin Park. The Grossman/Lyons in turn sold it to Her Madgesty Madonna Ciccone in 1993. The Kabbalah Kween quickly mortified and alienated some of her neighbors when she painted parts of the the exterior with red and yellow horizontal stripes. By some accounts, further renovations by the do as she pleases entertainer stripped the house of even more of architectural integrity. In a sensationally scathing November 2004 article in the Times Online, L.A. based architecture aficionado, noted real estate broker of iconic properties and nearby neighbor Crosby Doe was quoted as saying, "She wrecked it." Mister Doe went on to state, "They took the historic tiles off the roof, threw them in a dumpster and put on these Taco Bell tiles. It was one desecration after another." Oh, ouch! In 1996, not long after one of her security staff shot a stupid and deranged man attempting to scale the walls of the property, Madge moved on and the house was purchased by prolific and award winning commercial director Joe Pytka who has owned it ever since. Records show he forked over $5,300,000 for the property. Property records show the house measures 7,783 square feet with 9 bedrooms and 6 terlits. However, her trash talking brother Christopher writes in his salacious tell-all book Life With My Sister Madonna that, "The twenty-thousand-square-foot castle has five bedrooms, 7 bathrooms, stands of four acres of land, and–with its 160 foot lookout tower–feels secure." We'll let y'all decide who's figures are accurate. Keep in mind puppies, that for now, news of Castillo del Lago coming up for sale is just rumor and gossip. Got that? Rumor and gossip. 5.3 million in 1996 and 15-18 million now? Does he think the economy is booming? Or is he just living in fantasyland like so many home sellers today? Times must be tough in the advertising world as well. It is a historic property in a good part of town and unlike Wolf's Lair, is laid out well. It will sell. I was lucky enough to tour the house about 10 years ago and it is the coolest home I've ever seen. I don't think it's even close to 20,000 sf, but it is VERY tall, so it seems bigger than it really is. I vaguely recall the heat ole Madge took when she gussied it up fast-food style. Are there any more photos of it? I can't find any online. I'm obsessed with this house. The colors aren't nearly as bright as reported. Even when freshly painted. Now after many years they are even more muted. It was just a shock to see colors on what for many many years had been a cool white castle above the lake. Which was never really a lake...it was a municipal reservoir created by building a dam across a canyon with a stream running through it. It is the dam that gave way in the old disaster movie "Earthquake". Now the city has built large underground storage cisterns and the "lake" is just for looks. By the way, this is just up the hill from where one of Mama’s next stories will probably come from – Audrina Partridge’s (from “The Hills”) house that Mama wrote about a few months ago was burglarized on Sunday night. There is surveillance footage of the thieves. Looks to be a young couple in their 20s – probably fans of the show. This place does nothing for me. It looks like a convalescent home. No charm or grace about it at all. Kind of like Madge herself. pytka is old and screwed up from years of using a shoulder mount. the 9 flights of stairs is probably just too much for him these days. wow, it's really a beautiful place to go with..
One of Tom Petty's videos was filmed here - the pool scene where the chic chucks the oscar into the pool that Jonny Depp is taking a wee in. It's appearance does have an institutional vibe to it. Mama's "fortress-like" descrition is apt. Hope it has an elevator or two. Not only did Madge offend her neighbors by painting the gleaming white castle with surplus Dept. of Transportation curb paint, the incessant helicopters that ferried materials in all day long drove everyone mad. As Mama said... "John DeLario in 1926 and sits in the shadow of the Hollywood sign overlooking the higgledy-piggledy shores of Lake Hollywood." According to the book Houses of Los Angeles (1920-1935) by Sam Watters, the tower of Castillo del Lago was added to the house during 1970's. In the book there is a picture of Castillo from 1920's without the tower, and it looks weird. I like it more with it. This house is not worth more than $11M... sorry.. it is rich in history though. He will most likely sell it to the guy that is currently leasing it, who you may ask ? I don't remember any helicopters "ferrying materials". Would have been a ridiculous waste considering how easy it is to drive a semi right up to the gate of the house. if he was smart he would put it up for what he got it for or a little less, and maybe he may sell it. "here is the other problem, the location"
Then, I guess she doesn't mind wasting time and money, because those helicopters were there for a straight week! So Average Joe (pretending to be anon 1:00), you've been called out on this before. Please explain why ANYONE would sell to themselves to keep the values in a neighborhood artificially high when they are leaving the neighborhood. Why would they care? You make no sense. And apparently the "uber rich" and celebrities know something you don't. They have lived in this part of the Hollywood Hills since the birth of the motion picture industry in So. California. 2:42: How many helicopters did it take to build all those houses in Hollywoodland if it is so remote as to require airlifting building supplies? Did they have helicopters in the early 1900s? Not really sure about the whole helicopter debate but some of the little streets off of Beachwood are ridiculously steep & windy ... Just driving a car on them is an ordeal, never mind a huge vehicle with building supplies. For Sale ? by James Whorriskey (Delbert Jackson). Property records reveal that Madonna purchased the .59 acre property on N. Roxbury Drive with it's big Wallace Neff designed house from Diane Keaton in May of 2000 for an undisclosed sum of money, although it was reported to be around $6,500,000. Might be worth a punt, credit crunch and all that ! "worth a punt"...madonna.......no I won't say it, I just won't. 7:13 - you're posting about two different houses about 10 miles apart. Castillo Del Lago is on Durand in Hollywoodland/Beachwood Canyon (5:16 - wide and easily accessible in that part of the hills). The Wallace Neff house is on Roxbury in Beverly Hills. Madonna doesn't own either one anymore. Alot of weidos hang out on the track in front of the property. oh please ... L.A has lots of weirdos hanging out everywhere! Anon 3:52, calm down. I didn't say anything about the 1920s, nor did I imply that's the only way to get to the property. Simply recalling what Madonna did when she renovated the place. 8:05 - And you're full of sh*t. Madonna's brother (who did the work on the house when she bought it) didn't haul anything in via helicopter. I know. I asked him. Yes, 8:56am - and Madonna's brother is such a reliable, credible historian, no? He doesn't need to be a historian to know whether he himself hired helicopters for the renovation he did on the house, does it? Maybe you're old as dirt and don't remember what you did 10 years ago but that doesn't mean the rest of us are. good story & interesting house. i'd like a tour of this one. Wasn't it rented out to the forgotten scientology couple J & B Elfman? "Hey - Did you hear the rumor that Castillo might be hitting the market for 15 million?" "I read it on that site I was telling you about last year, the one with the gay guy who calls himself Mama." "Some queen is posting that you used helicopters to bring in the supplies when you redid the house"
"I know, can't believe everything you read on the internet but that one gave me a good laugh"
"Yeah, it still has your paint job and people are still talking about it"
Hi, i live in France, just came last year to see this castle, i would like to know who lives there? "The Kabbalah Kween quickly mortified and alienated some of her neighbors when she painted parts of the the exterior with red and yellow horizontal stripes." only trash would do that to a house.